HISTORY: The only team on the grid that can draw a legitimate line all the way back to the genesis of the Formula One World Championship way back in 1950, Scuderia Ferrari hold every conceivable record worth having - most wins by constructor, most constructors' and drivers' championships, most consecutive championships - and every single successful driver in Formula One either drove for, or wishes he drove for, the red team. In short: these are the daddies of F1. And the greatest Ferrari driver of them all? Some say Alberto Ascari or Gilles Villeneuve, both gone before their prime. Some say Nigel Mansell - those people are invariably British, and very, very wrong. For it was the legendary Michael Schumacher, the greatest ever to drive in anger; five of his record seven world championships came during a crushing reign with Ferrari from 2000 to 2004, when all was swept before them. And since then? A fallow period. Worse came in the eighties and nineties though, and with a combination of pedigree, budget, two of the very best drivers in the game and the bit between their teeth, no-one is ever willing to count them out. From Ferrari, accessed via BBC Sport. Other than looking a bit like a Ferrari-branded flip flop (cheers, Rich) thanks to the halo, this is a good-looking piece of machinery - and less white than recent years, which pleases us. 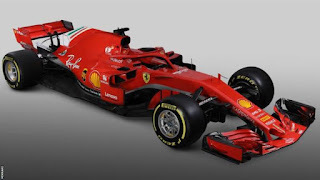 Ferrari should always be as red as possible, sponsorship aside. After a stellar start in the Red Bull young driver programme that saw him win a race in a Toro Rosso, Vettel was always likely to take a WDC at some stage. I don't think anyone was expecting four in a row, including two tricky down-to-the-wire jobs in 2010 and 2012. Surely this is Kimi Raikkonen's last year. The two get on very well, for all Kimi's bluster he's quite happy to play rear gunner at this stage, and Ferrari will be keen for Vettel to get a title under his belt before any driver upheaval, but he's simply not delivered to the extent that you'd expect either a former world champion, or a younger, hungrier driver to reach. Who next, though? Verstappen is much fancied, but we think he'll stay at Red Bull. It's too early for Leclerc, sight unseen. Could we see them revive their interest in Hulkenberg or Perez? These are questions for the silly season, around August time. LAST YEAR: 2nd in Constructors' Championship, 522 points. 5. Sebastian VETTEL (GER) - 2nd, 317 points, best finish: 1st (Australia, Bahrain, Monaco, Hungary, Brazil). 7. Kimi RAIKKONEN (FIN) - 4th, 205 points, best finish: 2nd. Looking at the gap, you wouldn't believe these guys were in with a shot at both titles until past the halfway point of the season, but that's F1 for you. Could a more motivated second driver have taken more points from Mercedes, particularly a shaky Bottas? That's one for speculation only. PROSPECTS: You never want to count them out, but a combination of Red Bull snapping at their heels, Raikkonen running out of steam and the post-Schumacher requisite multiple changes in operational staff could make this a muddled campaign. Still favourites for second at least.